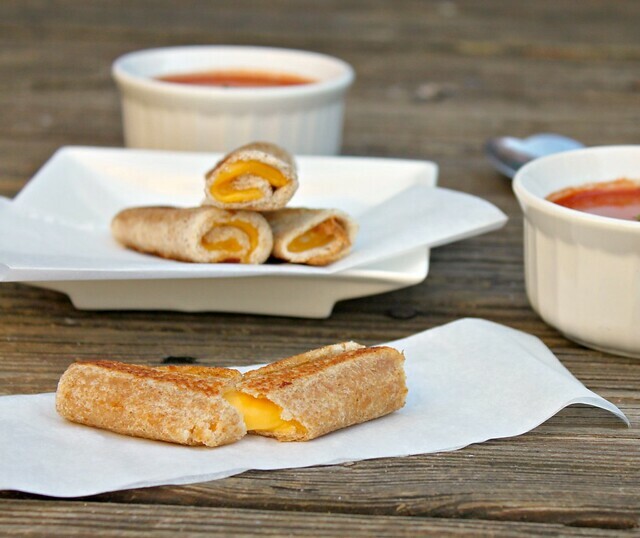 Kitchen Snaps: Grilled Cheese Rolls ~ A Fun Spin on an American Classic! 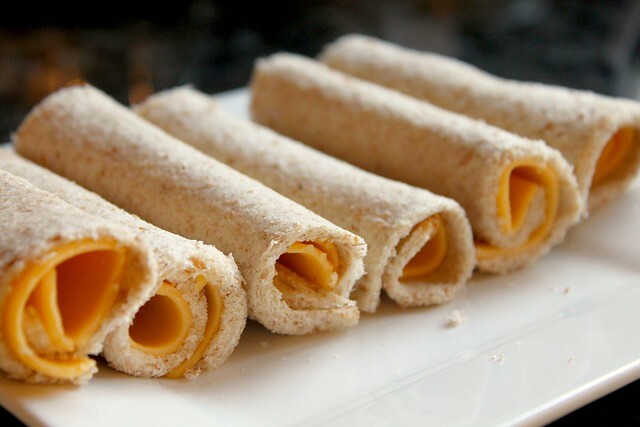 Grilled Cheese Rolls ~ A Fun Spin on an American Classic! 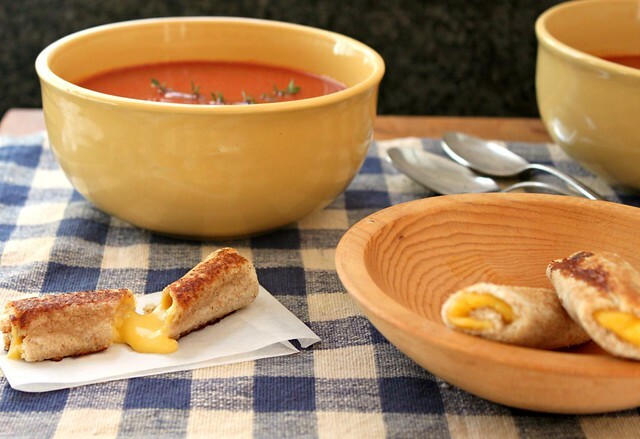 ...Dip these simple Grilled Cheese Rolls in a bowl of piping hot tomato soup or ramekin of your favorite marinara ~ and I dare you ~ I dare you to eat just one! 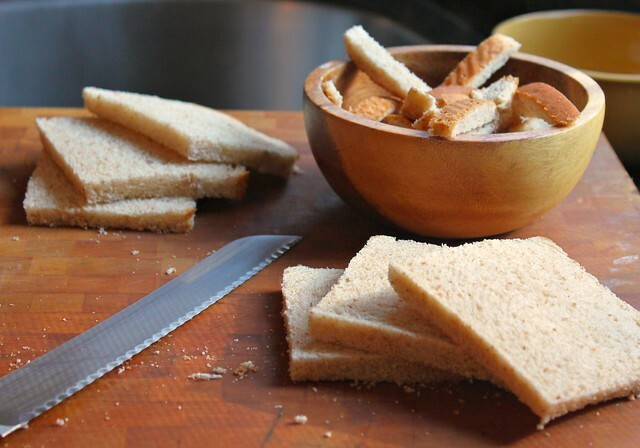 All you'll have to do is... cut the crusts off your bread, here I used a soft wheat. 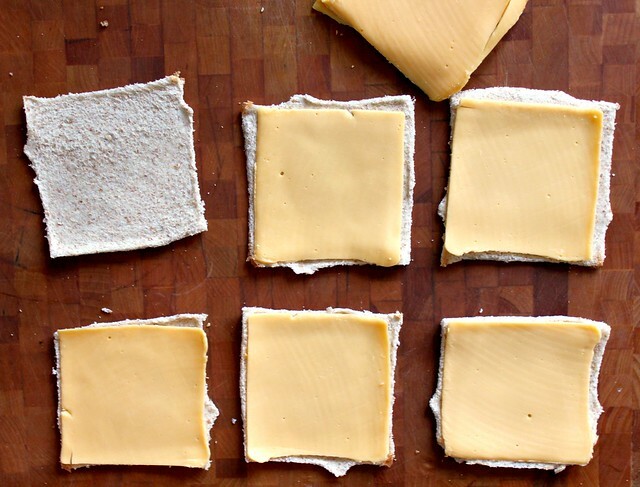 Flatten your crustless bread squares with a rolling pin and then top with one piece of American Cheese (do not be tempted to use more cheese, in this case one is enough) Here I used fresh, deli sliced, Land O'Lakes yellow American Cheese - YUM! 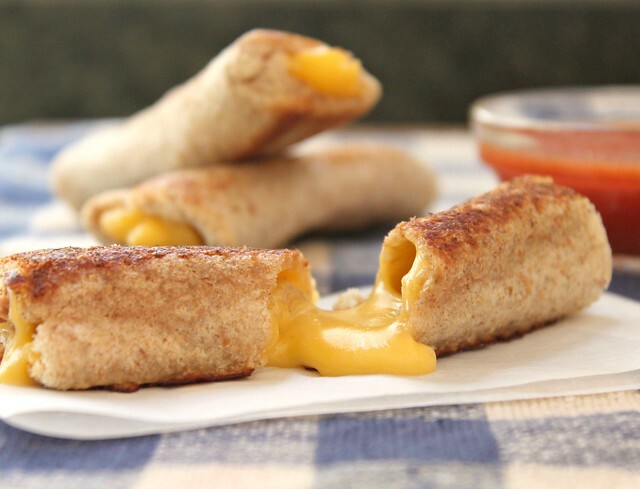 Remove from the pan and your Grilled Cheese Rolls are ready to enjoy! This is such a cute idea, I passed it on to my mom friends. I think you could add some chopped broccoli in there for fun. Now this is a great idea! I'm so making these :) Your photos are making me drool! Funny how something so simple can be so gorgeous and mouth-watering. I love this idea! Love it!!! It's official...you are a genius! I love these. A lot. Heaven. Pure heaven for my tomato soup addiction. Thanks for sharing. 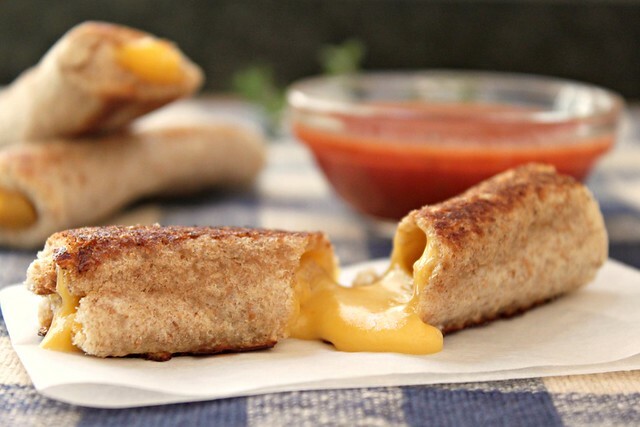 I LOVE grilled cheese, and these just look adorable and delish!!! I so have to try these! Would be great for kids or a party!! How fun and soup-friendly! Love it. Oh my, so many cheeses would work! How about Brie and thinly sliced apple! I made some with Jalapanoes rolled up inside! Soo good if you like that spicy kick. I made these with creamy tomato soup after finding them on pinterest.com yesterday. Brilliant! They made my day- and the little crispy cheese that oozed out onto the skillet YUM! love this idea. totally perfect for lunch with the kids. so excited to make these. Repinned to my savory board! I just made these for my girls today. I was even able to sneak a little sweet potato puree into them! They loved them! thanks all! <3 your comments! Found you on Pinterest - have shared it on my FB page...am making these today - one of our favorite foods!! Wonderful way to get your children involved in the prep for the meal...they always eat better when they help, don'they. Just made for my 2 two year olds and tgey r admit.g for more. I made these to go along with some homemade tomato soup today & my toddler LOVED them. We've never been able to get him to eat grilled cheese until now! Thanks so much! PS- I'd love to have you guest post sometime! What a great idea. I love this! Simply love this idea....having a poker game tomorrow night at my house and I am making my potato soup and this will be my side item as opposed to cornbread...thank you so very much for sharing! thanks :) I'm just so happy you all love them xoxo Let me know the combos you came up with!!!! We added a little schmear of greek yogurt between the bread and cheese. Sounds odd but adds a lovely zip and even more creaminess! Plus I will finely chop spinach and put it in 4yr old's grilled cheese. After the promise that it was only there to make the sandwich pretty and it had no flavor...she ate it! Now she always asks for the pretty gc! Thanks for the roll up idea, we are HUGE gc fans in our house! I can not believe how easy it is to make these. You can get a real production line going. Freeze very well either before cooking or after, though freezing after makes it easy to nuke for a few seconds and then eat. Super yum with a little Italian spice and/or pepper flakes. This is great. You thought of doing this with a thin layer of meat in there? Think it'd be messy? I made these tonight but added pepperoni and we dipped them in pizza sauce, delicious!! Must add onions next time!! Thanks for the great idea! I saw this on pinterest and posted a link from my blog to yours. Thanks again, loved it! Love this, such a cute idea! I'm making these tomorrow!!! done deal!!! SO EXCITED!!! Im making these tomorrow! done deal!! so excited!! Perfect! A fantastic idea! Except for the American cheese. Which is not actually cheese. I'm going to try it with grated cheddar! Yum! I just tried this and i followed the directions perfectly and they fell apart as soon as I turned them. I tried this and it turned out horrible. I followed directions to a T. It fell apart immediately. So disappointed. Here in the South Island of New Zealand we've been making cheese rolls for decades! Schools and clubs make and sell them as fundraisers and they're sold in heaps of cafes too. I could eat them forever! I love these but often change it up. You can even preamble this and wrap in tin foil until the next morning if you want ! I used your recipe today in my daughters lunch! Thank you everyone, for your comments and ideas! Love it all - keep them coming!